Apple Watch 2 – Worth the Investment? 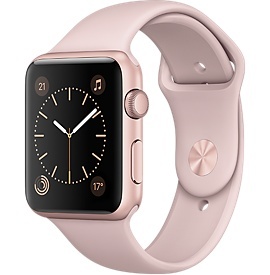 BANGOR – The Apple Watch 2 was released on September 16, 2016, which makes it almost a year old now. Being the exercise and tech junky that I am, I always wanted to try using one to track my activity, but I could never justify the price – starting at $269. A couple girls I work with have them and couldn’t say enough good things, so I told them I had to write this article and one of them let me borrow hers for a week. calories I was burning. I sold that pretty darn quick. When I first put on the Apple Watch, at first glance it’s already much smoother and aesthetically pleasing than the Fit Bit. It’s also a light pink color which I like because it doesn’t stand out as much against my skin as say, a black band would. The screen is larger than the one on my Fit Bit, and it does MUCH more. As you can see in this video (https://youtu.be/kqpm5ArEj5A), the home screen displays the time, the number of active calories you’ve burned (red text), the number of active minutes (green text) and how many hours you have at least stood up throughout the day (blue text). The display menu is customizable through the iWatch app on your phone. The top button allows you to see all of your apps on your home screen and scroll throughout them as you wish. The bottom button brings up the recent apps you have used and allows you to slide through them. I am still learning more tricks, but these are the very basics! Within the first 10 minutes of wearing it, I was overwhelmed with the amount of technology in this small watch on my wrist. I was receiving my text message, Snapchat, Twitter, and Facebook notifications before they even popped up on my phone. You of course can personalize all of this and turn those notifications off if you want to, which I did just because I felt like I was constantly being interrupted in my workouts. Also, because the screen is so small, it isn’t overly convenient to reply back to texts you receive by using the watch. There is a “scribble” feature where you can write your own letters and it will recognize and type them, and there is also a microphone button that will translate your speech to text, but the scribble feature is very time consuming for someone like myself who is able to text very fast when using a phone, and the microphone doesn’t really work if you’re anywhere noisy. As for the fitness tracking within the watch itself, I love it. I tighten the band one notch when I’m at the gym so it’s easier for it to register a heart rate and it definitely recognizes it going up and down when it should. It tells me how many active and inactive calories I’ve burned throughout a day, which makes it easier for me to decide how many calories to eat each day to achieve the goals I’m pursuing. Overall I feel the Apple Watch 2 would definitely fulfill my fitness/nutrition tracking needs, but I still couldn’t justify paying full price for one at almost $300. I feel all the extra technology within the watch is a little bit much for me, just because I prefer to take my phone everywhere with me anyway. If I could find a cheaper tracking watch with the same heart rate accuracy as this one, I would definitely buy it. There are rumors that the new Apple Watch 3 will be released in late 2017 or early 2018, which will have a few improvements such as a FaceTime camera and wireless charger. It will start at about $349 at the time of the release, and increase to $369 after some time.